Marco was born in 1968 in Arequipa, Peru, at the foothills of the Andes. University Graduate with a degree in art, he received the Unesco-Aschberg Prize in Paris for his art to preserve the Amazon Rainforest. 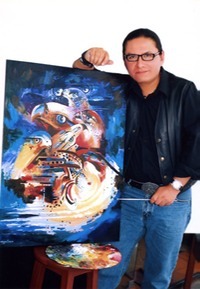 His paintings capture the color and vibrancy of the stories and spirits of his ancestors, using his unique interpretation of the Amazon and Inka culture as a starting point. Marco's paintings have been featured in exhibitions though out the world; Nice, Limoges, Tokyo, Sao Paulo, Buenos Aires, Lima, New York and San Diego and his work has also been featured on Peruvian postage stamps. Marco uses his art to help adults and especially children understand the importance of saving the precious rainforest of South America. Marco works in a variety of mediums. His favorites are oil, acrylic, and watercolor.